The future Virginia-class attack submarine USS Illinois (SSN 786) conducts sea trials on Aug. 1, 2016. General Dynamics Electric Boat photo. The Virginia-class submarine program office is looking to get its attack boats out to the fleet faster through shortening the post-shakedown availability period to just three months, the program manager told USNI News. Capt. Mike Stevens said at the annual Naval Submarine League symposium that operational commanders wanted more boats and faster, and while procurement rates cannot be bumped up in the near-term, the transfer of new construction boats to the fleet could be sped up a bit. 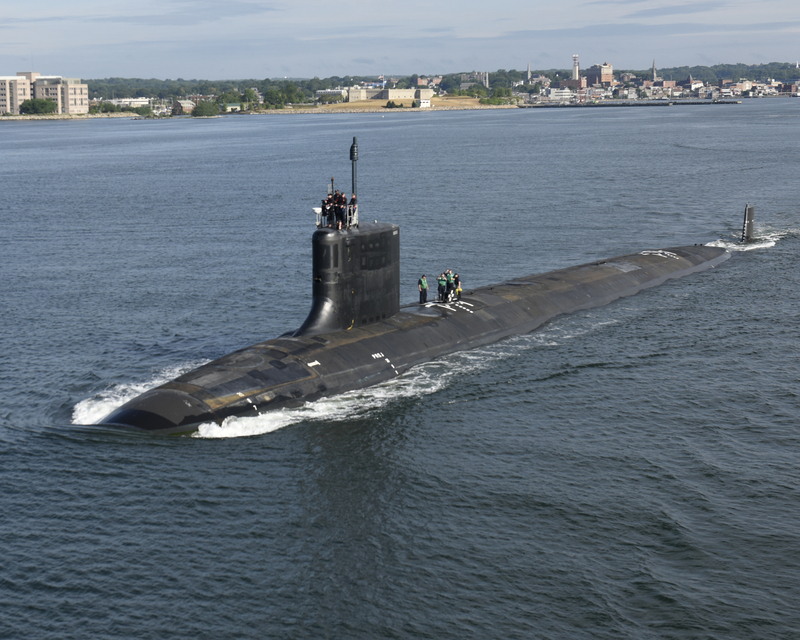 PSAs are currently contracted to last six months, but the last two boats, USS John Warner (SSN-785) and USS Illinois (SSN-786), wrapped up early. “We put our foot on the gas pedal and we pressed on the post-shakedown availabilities to get those shortened so that we can get these very fine submarines just out to the fleet faster,” Stevens said at the Nov. 1 event. Stevens spoke to USNI News today and said that reaching this three-month PSA goal was built into the acquisition plan and comes as the program design and construction has matured. “The big thing we’re seeing is we’ve updated the tactical systems already in the new construction build cycle, so that doesn’t require any sort of upgrade in PSA,” he said. Stevens told USNI News that the actual shakedown period itself is being trimmed a bit, down to a three- to four-month range, as the program identifies efficiencies in the test schedule after a boat is delivered to the Navy. He noted it would be harder to reliably keep to a shorter shakedown schedule, since weather, test range availability and other factors come into play. But ideally, between the effort to shorten the shakedown period and shorten the PSA, operational commanders should be able to start working with an SSN about six months after delivery. “It is challenging on the crew to maintain that operational proficiency when you’re in a drydock. Minimizing that time so they can do what we’re training them to do is really our goal here,” Stevens said. Program Executive Officer for Submarines Rear Adm. Michael Jabaley said at the Sub League event that the high quality of submarine construction and the improved delivery timeline would support the program’s goal to reach a three-month PSA. With less work being intentionally deferred, and less work being created during the shakedown – the test period is meant to run the boat hard and identify anything broken, defective or poorly constructed on the sub, so a better quality boat generates less work for PSA – Jabaley said the program is capable of reaching its goal by the end of Block III, with the future Delaware (SSN-791).